Mount Tamalpais was dripping last Sunday. 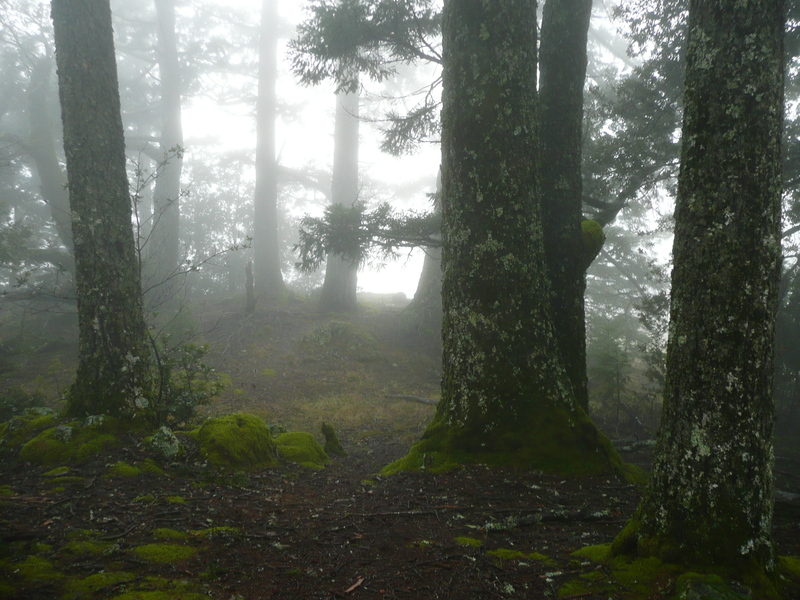 We went up between the rainstorms, through fog so thick the drive was frightening, but the walk through cool silence was something absorbed through the very pores of our bodies. The grass that was gray last time is now disappearing under a growing layer of green. What is left is turning golden brown. Rock Springs is running. I filled three half gallon jars and together we sang our thanks to the music of the running water. We know what feels good. We know what we need to do. The song of life sings through us. We turn towards life. All we need to do is follow that turning in all that we do. Is changing our ways really so hard? We’ve done it so many times in the last two centuries. All we need to do is what we always have, to grow towards a better life. The only difference this time is that we have to take into account the consequences of our actions on the whole planet, not just ourselves. Now that we know that we’re all connected, we can see that that’s in our best interests, can’t we? Even in my neighborhood, where people tag any open expanse of clean wall and throw trash around with gay abandon I see the changes beginning. There were three houses with roosters on my morning commute last year. Now I hear crowing from at least five. More bicycles share the road with me than ever before, even if a lot of the drivers still treat stop signs as decorations. They slow down, take a look, and roll on through. There were always some gardens in place of lawns in a lot of the yards, but slowly, slowly more of them are appearing. Think what it could be like. What if we made clean air, clean water, clean earth a priority? What if we opened our streams and creeks to the sky and kept them clean? What if we expected the water in them to be clean enough to drink, and it was tested regularly to make sure this was so, just as our municipal water supply is now? What if we could plant things in our gardens, knowing that the soil was clean because that is as basic a thing in a house for sale or rent as a good foundation and working plumbing? What if apartments came with garden plots, not parking spots? And public transportation was clean, safe, pleasant, and ran 24/7? If public transit was a real priority, we could all enjoy a quick, direct ride to wherever we were going, and be able to use our digital devices safely and sanely. We could read instead of sit in traffic. What if cars were a public utility? Each neighborhood has a lot, and you rent them by the hour? Crazy? I don’t think so. I’m living this life as far as is possible without public support, and while it could be better, it isn’t half bad even as it is. My problems are mostly financial, not infrastructural. I’m not saying that everyone has to live the same life, and I’m not trying to pry your hands off your steering wheel or make you shiver in the dark. What I’m trying to do is spread some ideas and blend them with others so we can make changes in the way we live while we still have some quality of life. I’m trying to show how we can have a better life than we do now. If we all walked more, we’d be healthier. If we drove only when we really needed to instead of all the time, our streets would be safer in so many ways. The streets of Oakland are dangerous mainly because there are so few people using them, and we don’t know our neighbors. What would it be like if there was always someone on the street, if we could put names to faces? Don’t you think that if people doing crappy things were easily identified, and if we all spoke up when we saw bad things happen, that we’d all be safer? Our neighborhoods aren’t really ours, have you noticed that? Do you know what’s around the block and down the street? Do you know who lives there? If you have a neighborhood park, have you been there? Do you feel safe there? Is there a decent grocery store, restaurant, coffeehouse, or other stores close enough to walk to? Do you know the bus routes around you and where they go? Do you feel safe on them? If only a few of these things are true, do you really feel a part of where you live, or is it just a place to sleep and keep your stuff? Is it truly a place you can call home? Is this really how we want to live? What do you know about your food? Have you ever looked into the eyes of the animals your food comes from? Does that last sentence sound scary and weird to you? If you’re vegetarian, and more power to you if you are, you might want to skip the rest of this paragraph because I’m talking to the omnivores now. I invite you to look into those eyes. Our collective health depends on it, and it can be a very powerful and empowering experience. When I had chickens (and when I have them again) it was very comforting to eat an egg breakfast while our hens scratched contentedly in the yard outside our kitchen window. We knew without a doubt that our breakfast came from birds that were having happy lives. The bargain between us was sound–they gave us eggs, we gave them food and shelter and a pleasant place to live. It isn’t necessary to keep the chickens or the cattle yourself. What if it were possible to walk around the corner and buy eggs and milk from a neighbor or a neighborhood farm and see up close how those animals were treated? And if you eat the whole animal, is it really better to see it only as an anonymous bit of flesh in a styrofoam tray? Is it safer to have no idea whatsoever where it came from and what kind of life it led? Our vegetables and grains are no better. While I’m not expecting anyone to raise all their own food, I think we can get most of it a lot closer to home, and I think we’d be better off for doing it. We’d use a lot less energy and we’d have a much safer and more reliable food supply. It’s the difference between having terminals off a mainframe computer as opposed to a lot of laptops. We’ve chosen the latter for years because of the independence and reliability such a diffused system provides, and because it gives us all so many choices. There are other examples, the quality and variety of craft beer as opposed to big brewing is to many of us a definite improvement. If you buy your vegetables and other foods from local producers, you have a real person to go to in case of trouble and you can go and see how your food is being produced. This is all very up close and personal, and probably downright scary to some. I’ve avoided getting into specifics on this blog, just as most businesses have. We prefer to talk in generalities like energy independence and food security. The problem is, apart from a few of us who know we are hungry for such things, no one is moved to make any changes. There are no specifics to sink our teeth into, no specific actions to take other than buying a different brand of garbage bag or getting a steel cup. Changing our light bulbs and buying cars that get better mileage are pretty much non actions. We’ve been doing these things for years and what has changed? Only the labels in the grocery stores and the brand names on the cars. Public transportation in my area has actually gotten worse, and we’re still driving to work one to a car. So here are a few of my ideas. I’m offering them as a starting point, based on the actions I’ve already taken and the ones I’d like to see us take as a city, a state, a nation, and a world. I know yours are different, and only by blending our different ideas and doing our own experiments with change will we come to a place where we’re all served, where all humans have food, shelter and clothing, and all beings have food, shelter, and a decent place in the web of life to live. We all deserve better than we have right now–what do YOU want to see changed? I took a bottle of Rock Springs water with me when I busked this week. That’s something I haven’t been able to do since December. It was as always, water from the heart of the earth, cool, refreshing–and clean. Thank you for your voice, sister! I and we could do so, so much more, and the beginning is to realize as you so beautifully said, that we are all connected, that there is no separation, that individual choices are collective choices are choices to live as/on the whole as well as possible. Here are a few things I do, which I’m adding for sake of discussion. By default, but now also by choice, I don’t have a car and when a car is necessary I ride with others. I get all my beauty, hair, and other such products second-hand or from an online store called vitacost that offers toxin and cruelty free, non gmo products. I recycle everything I can. There are many other things I do, but even more we as a community need to do such as provide assistance to and at farmers’ markets for people with disabilities, plant community gardens, try to buy as much locally as possible, not just food! and *knock off the fracking in general but especially in an earthquake state. * Take it one choice at a time, always do your best, be present. Hugs. It’s me again. BTW for some reason your post Worlds Apart isn’t showing up on your blog, but shows up in my gmail. In case you didn’t take it down on purpose. Next Next post: Why Do We Prophesy Our Doom?